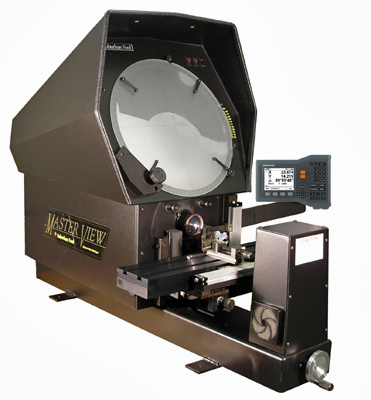 MV-14-H MASTER-VIEW™ 14" OPTICAL COMPARATORS by Suburban Tool, Inc. Direct measurement of points, lines and circles. Type B USB data interface. Graphic display of measurement results. Surface illumination through duplex fiber optics. High capacity 4" x 8" travel stage with 4-1/2" x 19" work surface. Ball way construction handles loads to 100lbs. Two long-life tungsten-halogen light sources. Extra bright surface illumination through duplex fiber optics. Individual switches select profile, surface or combination surface-profile illumination modes. Heavy-duty monorail type formed welded steel frame. Rotary frosted glass screen with 90° crosslines and 360° protractor markings. * Digital readout supplied by Heidenhain.